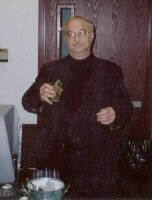 As a mixologist -- sometimes in my persona as "Colonel" Nickell (see Kentucky Colonel) -- in addition to tending my own home bar, I occasionally served as an auxilliary bartender at Center for Inquiry functions (as shown here). 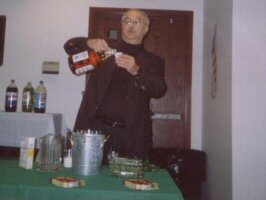 My main task was the making of mint juleps, since I wrote a book on the subject. 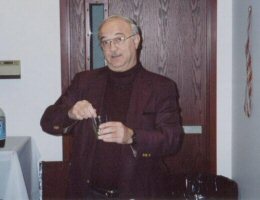 I have created a few drinks as well, notably "Colonel Nickell's Perfect Julep" (p. 43 of my The Kentucky Mint Julep, University Press of Kentucky, 2003), but also a number of cocktails.